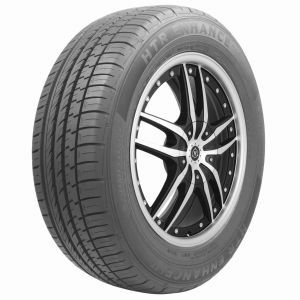 Featuring industry-leading warranty protection and engineered to go the distance, the HRE ENHANCE is the next evolution of the performance touring tire. The ENHANCE C/X is tuned to meet the unique performance and durability requirements of drivers of later model crossovers and SUV's. 2. ASYMMETRIC 5 RIB PATTERN: Enhance ride stability and even wear. 3. LONG LATERAL GROOVES: Enhance superior all season wet traction performance. 4. WIDER OUTSIDE BLOCK: Enhance high speed handling and cornering stability. 5. STRATEGIC TREAD BLOCK SIPING: Enhances prevention of irregular tread wear. 6. MULTIPLE WIDE CIRCUMFERENTIAL GROOVES: Enhance water evacuation to prevent hydroplaning. ROAD HAZARD PROTECTION WITH (1) YEAR OF PURCHASE DATE OR WITHIN THE FIRST 2/32NDS OF AN INCH TREADWEAR (WHICHEVER COMES FIRST).